Unlike the wiring on the first A&O, all aspects of electrical work on 2.0 is being designed by crew members (and electrical engineers) Bob Sobol and Vince Griesemer. This is both a blessing to me, and a great benefit to the railroad. Wire gauge with voltage drop calculations, power districts with anticipated current draw, and many electrical devices- commercial and home made comprise the basics of the system. 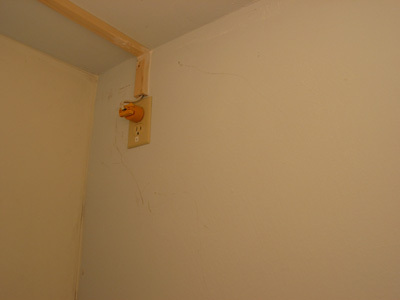 To facilitate easier viewing of the wires from under the layout, the underside of the plywood and framework was painted drywall primer white before construction. Holes were drilled through the crossmembers to support the various power buses. 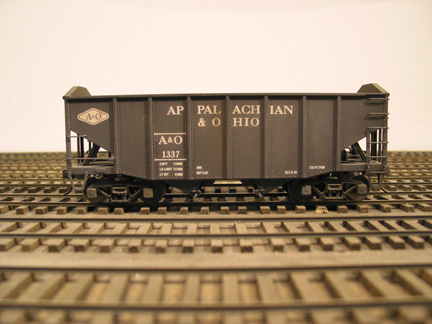 As rail is laid, the appropriate color wire is soldered to the underside of each rail and fed to the underside for later connection. Wires are gathered, braided, and soldered as a group to their bus wire. To ease alignment and mounting of the Tortoise switch motors, vinyl underlayment wood is cut and drilled to allow mounting of the Tortoise. Slots on the edge of the board allow for adjustment of the motor before two screws affix it to the layout. The block detectors are a homemade design by Vince Griesemer and feature a toroid transformer to sense DCC current. Each block has an on/off toggle to fully isolate the block to greatly aid in finding a short on the layout. Bob Sobol is making six power supplies giving current for 10 amp DCC boosters. It provides +12 and +5 volts DC for panel power and CMRI circuits. And it provides a home for circuit breakers, and a DCC ammeter. These are spread around the layout. Lighting for 2.0 uses a combination of 4' electronic ballast florescent fixtures with Philips F32T8/TL930 bulbs and 35-50W 12v halogen white floods (fixture MR16). These are mounted on a light valance with the halogens spaced about 6' apart. As the photo shows, the florescents provide the overall lighting, and the low, angled halogens provide the sun shadows. Having wired the basement for the RR lighting, it was a simple matter to connect the lighting circuits to the ceiling outs. They are switched in the dispatchers office. Looking at the ribs and grabs on A&O 1337 shows the subtle, yet detail-popping shadows provided by the low-grazing halogen floods. "Let there be (sun)light!" Lighting the lower deck of Willow Creek was accomplished using "puck lights" aimed upwards, letting the light diffuse and flood the yard below with even light. Aiming the lights downward produced segmented pools of light and dark areas; not good. Up is better. The puck lights are on a dimmer for softer lighting, and keeping them just below full voltage should insure they never burn out. A blue rope light along the front edge will provide lighting for night ops. A work station under construction in Fillmore Heights shows the rope lighting installed for night ops at each station. Car cards will thus be readable under the moonlight of blue rope light. This is the work station between Morrison and Ricksburg showing LED strip lighting for reading car cards and night ops. The LED's are dimable lest they be too bright during night ops. This is the underside of the work station (at the left). It also has LED light strips to illuminate this area during day ops. Notice the blue rope light threaded next to it for night ops. The most massive panel on the layout is the Dogtown Yards which handles the staging under Millport's Havens Yard. I did the artwork and made the panel on translucent acrylic and Bob Sobol did the electronics. The back lighting for night ops makes them easy and a joy to use. Bob Sobol has spent hours gauge-checking wheelsets and putting on resistors to make the car visible to the track detectors. All a necessary part of the CTC signaling system. A bank of track-block detectors with Chubb s-mini board servicing the beginning of CTC from Point Vincent to Glen Forge. All blocks have an on/off toggle to help isolate should problems arise.